A girl. A wolf. A witch. A woods. It is a story we know well, or at least, we think we do. 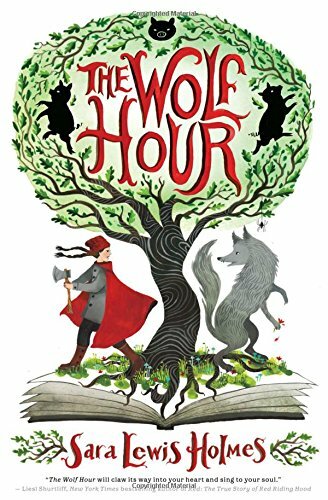 Sara Lewis Holmes’ The Wolf Hour takes the old fairy tales, weaves them together, and gives readers an entirely new story. In this reinvented once upon a time, the Three Little Pigs want their mother to come home, Little Red wants to be a woodcutter, and the Big Bad Wolf (with both big and bad up for debate) just wants to hide in his tower and read. Stories have life and power. Animals can talk. The danger of the woods calls to people and getting lost within it’s depths can make you go mad. Only the color red can protect you and magic stolen from the forest and purchased can deter you from entering. I love a good retelling of a classic and enjoy the challenge of paying homage to the original while the writer still makes it her own. Told in alternating chapters, Holmes follows the stories of the Three Little Pigs, Magia, and Martin and their adventures both in and out of the woods. On the edge of the forest, readers meet Magia and her family. With a red hat, a father who is a woodcutter, and a forest to walk through, readers will immediately link Magia to Little Red from the tales of the Brother’s Grimm. However, Holmes pushes her forest a little further to the east, referring to it as the Puszcza (Polish for Forest) along with other Slavic terms that will require context clues (or quite possibly a Google search) to ensure understanding. While a little more work on the reader’s part, the choice to include words from other languages adds color and richness, bringing the world of the story into sharper focus. All Magia wants is to be a woodcutter like her father and to know the secrets of Puszcza. While she is sure she is up to the task, her father tells her she does not yet fully understand the cost of being a woodcutter and her mother has plans that Magia will go to the city and grace people with her exquisite singing voice. So Magia, honoring her mother’s wishes, goes to the city to meet with the best music teacher–Miss Grand. It unfortunately doesn’t work out when Magia breaks Miss Grand’s metronome (which is in the shape of a little pink pig…). She and her siblings are thrown out of Miss Grand’s house and told to not come back. Further tragedy falls upon their family on their way home from the city, causing Magia’s mother to withdraw into the dark, and the community begins to whisper rumors that their family is cursed. After a particularly harsh winter, Magia’s father enters into a bargain with the witch to bring his family back together. In a forest where a story might trap you and swallow you up, the mother of the Three Little Pigs is taken and in order to get her back, they make their own bargain with the witch. They are forced to act out their story over and over again to pay their mother’s ransom–a story which captures and claims Martin’s father. Martin’s mother watches the loss of her mate within the story of the Three Little Pigs. 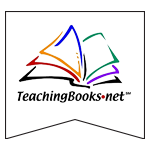 In an attempt to save her son from such a fate, she teaches him that facts are all-important and that stories are dangerous–why do all the stories have wolves as the villain? Martin lives in a tower which houses a vast library of encyclopaedia and he spends his time with his nose in titles such as Elementary Principles of Shelter and Safety for the New Builder and Social Pleasantries and the Other Underused Graces. One day his mother goes out on her own and doesn’t come back. In an attempt to find her, Martin ventures beyond his tower and is nearly entrapped in the Pigs’ story. However, he is pulled away by a howl that is stronger than the story and he makes it back to his tower. As winter is ending, Magia has been secretly knitting a red hat like her father’s in the hope that he will let her join him in the forest. When she goes out to collect some wood for the fire, she hears the call of the Puszcza. Armed with her hat, she enters. After getting hopelessly lost in a storm, she hears a cry and soon finds herself nose to nose with a wolf cub. From here on out Magia and Martin share a connection as they feel they are both made of the magic of the Puszcza. Even though they are separated after a night in the biggest piglet’s cottage, the two want to find each other again. Upon her return from her adventure in the forest, Magia’s father brings home a clock that restores her mother to the land of the living; but she is not the mother Magia remembers. Struggling to adjust to the new home life this change brings, Magia is tempted into the Puszcza by a red cape. Before she knows it, her father is gone, the rest of her family is caught in a deep sleep, and she is now the woodcutter she always wanted to be, but at a very high price. Trapped in a tale to finish paying off her father’s debt to the witch, Magia races against time to save what is left of her family. Two years pass and the three tales weave tighter together as the piglets send Martin into Little Red’s story to pay off their debt. Here he will run into Magia in the new role she has to play with dire consequences. Magia is faced with a terrible choice: her wolf or her family? Can she outsmart the witch to save them all or will she lose everything she loves? This retelling brings the classic up to date and re-invents it as a new cautionary tale for the 21st Century. While it can simply be an enjoyable quick read, one can take the time and look at it deeper. In our current world where anyone can put a story out there with dubious origins or editing and claim it to be true, our “news” has to be vetted by the responsible reader. We are fed snippets of the whole picture in our daily scanning of social media and people can get lost in a digital forest of society’s creation. Our students have never been more aware that a truth and a story are never as clear cut as it used to be in a fairy tale. Someone trusted can be a villain and someone who appears villainous, could just be misunderstood. Holmes doesn’t shy away from this. She gives her readers a character who has to live with the consequences of her actions and find a way to fix things. While she is rewarded in the end, it is not a certainty. I love that while Magia is head-strong and wants what she wants, at her core, she is driven by her love of family. She is aware of what is happening throughout the course of the story, even when other tell her she is wrong, and she is validated at the end of the book. It is refreshing to show the narrative of the child and a female who should be believed, especially in a literary tradition where the children often cry wolf and girls need to be rescued. Overall, the tale is sure to delight lovers of fairy tales (both classic and fractured), lovers of music and stories. With a publication date of this year, it is a great addition to middle school classroom libraries where fairy tales and folk stories are popular. It can be read as deeply as one likes, but as always, beware–the story could just swallow you whole. The Wolf Hour by Sara Lewis Holmes. 2017. 9780545107976. 5-8.